The Handbook of Alternative Theories of Economic Development is a refreshing initiative of creating an engagement with alternative ideas of development that challenges the four decade-long dominant paradigms of mainstream economic theory and development policies. The discipline of economics, and more so development economics, has witnessed a considerable flattening in terms of ideas and imagination during the period of finance-capital driven globalization. The triple crisis of finance, food and fuel that hit the global economy earlier in this century has remarkably exposed the limitations of the neo-classical economic theories and consequent neo-liberal economic policies. Ironically, this poverty of theory and the prolonged crisis in the global economy provides an opportunity to revisit the origins and history of the discipline of economics. The editors of this Handbook precisely use this opportunity to initiate a restoration of the richness of the discipline. A collection of 40 essays, each challenging some aspect of mainstream neo-classical economics, makes this Handbook a must-read for students, practitioners and policy-makers, if one wants to not only make a better sense of the current doldrums in the world economy, but more importantly, for adopting fresh approaches to development in future and not remain captive within the failed reductionist economic paradigms. The essays are organized into three parts. The first part explores development thinking across history and geography engaging with the rich ideas that existed in the non-Anglo-Saxon world within Europe and in the non-European world across the continents of Africa, Latin America and Asia. The second part deals with the various approaches for understanding development ranging from Classical and Marxian outlooks to the Evolutionary and Feminist lens. Finally, the third part brings together essays on diverse aspects of development like the agrarian question, planning, environment, effective demand management and late industrialization, to name a few. While it is neither possible nor desirable to discuss the arguments of each essay within the scope of this review, it would be worthwhile to draw attention to some of the coherent critiques of certain fundamental aspects of mainstream economics that have emerged across various essays. Reflecting on the essays across the three parts of the Handbook, one realizes that most of the arguments are drawn from within various traditions of political economy. The second Great Divide in economic thought, represented by the Methodenstreit in the late 19th century, was a false binary that got created between Theory and History. As Schumpeter later observed, the Historical School was not against theory per se, but against ‘universal theory’ which is devoid of social and historical context. Nonetheless, the result of this binary was the emergence of Economics as a discipline that expunged the ‘social’ and the ‘historical’ from its boundaries. Thus, a divergence was created between Political Economy, which practised a wholesome view of the economy in concurrence with society, polity and history, and Economics, which increasingly moved towards axiomatic universal theoretical principles. In this light, this volume can also be viewed as an attempt to bring in the rich traditions of political economy back into the discourse in economics, albeit in an unconventional manner. That the collection of essays is an unconventional engagement with political economy is evident from Part 1, where there is a clear move away from the Anglo-Saxon traditions of political economy, embodied in the writings of Adam Smith and David Ricardo. The latter’s economic philosophy was marshalled by the British Empire, often in a reductionist fashion, to impose the principles of free trade and free market on the rest of the world in the 19th century. There was strong policy resistance to the free trade maxim emanating from within Germany and USA, driven by their industrial interests. Such alternative discourses have been clearly obliterated from the development discourse for justifying the neo-liberal prescriptions of the Fund-Bank-WTO triad since the late 1970s. A set of articles by Erik Reinert, Philipp Rossner, Arno Daastol, Sophus Reinart and Wolfgang Dreschler coherently exposes the various theoretical omissions and fallacies of the free trade discourse based on Ricardian comparative advantage, both when Britain pushed for it in the mid-19th century and in more recent times as part of the finance-led neoliberal discourse. Reinert draws attention to the two Italian thinkers from the Renaissance, Botero and Serra, and their ideas foregrounding ‘increasing returns’ in manufacturing activities within towns/cities leading to wealth creation. These were early ideas on the significance of industrialization for development of the human race. Unfortunately, Reinert points out that neo-classical economics, enamoured by the concept of ‘equilibrium’ (which required decreasing/constant returns to scale for its existence), expunged the idea of ‘increasing returns’ from the discipline. Thus was sidelined the rich and diverse experiences of industrial development in different parts of the world. The free trade discourse shifts the focus of policies to exchange of commodities in the internal markets away from the domain of production. By invoking comparative advantage, it tries to restrict industrial production to those countries already in the ‘advanced’ club and relegates the rest to primary commodity producer and exporter. Without the alternative discourse propagated by the likes of Friedrich List in Germany or Alexander Hamilton in the US, one would have not witnessed the spread of industrialization of different parts of the world. The essays on the German tradition of Cameralism, focusing on production, Kathedersozialismus (or the ‘Social Question’) and the ideas of Friedrich List on industrialization clearly underscore three aspects of development. First, manufacturing is not a homogeneous entity driven by given technology but the precise organization of production and an evolving set of institutions is central. Secondly, such organization of production is necessarily qualified by the specified social questions; Kathedersozialismus, in fact, clearly rejects the expelling of the ‘social’ and the historical’ from economic theory and sticks to the political economy tradition. Finally, the Listian ideas on industrialization, the contextual role of protectionism and industry’s linkages with agriculture emphatically states that no ‘one-size-fits-all’ prescription can work for different countries. Colonialism is another aspect of development that keeps coming back across various articles in different ways. Sophus Reinert emphasizes the direct relation between trade and war, evident in intra-Mediterranean conflicts but also in the European conquests of the world since the 16th century. Ali Kadri in his essay on ‘Islam and Capitalism’ states in a more clarified manner that the great divergence between the West and the Rest had to do less with the differing social formations in various regions but was more driven by the aggressive conquests of various trading posts and routes by the European powers. The connection between military power and development continues to the current times centered on the control of scarce natural resources. These discourses are valuable since neo-classical economics have consistently avoided modelling ‘power’ whether that which is embedded in national social structures or that within the international geo-political domain. The economic machinations of colonial empires are elaborated by G Omkarnath in his essay on Indian economic thinking. Both the ‘drain of wealth’ and ‘de-industrialization’ were crucial in the generation and perpetuation of underdevelopment, not only in colonial India but in the wider colonial world. Prabhat Patnaik extends the conceptuali-zation of imperialism to the postcolonial world by focusing on the stability of the ‘value of money’ and how that is possible through an imperialist globalization which continuously squeezes the purchasing power in the ‘non-capitalist’ sectors of the economy. Decolonization was an important intervening conjuncture in the history of development, which allowed and compelled the introduction of diverse approaches to development. The various essays in Part 2 on evolutionary economic theory, feminist approaches, regulation theory, Marxian-Kaleckian approaches or the balanced-unbalanced growth hypothesis of Albert Hirschman reflect these experiments. A few essays in Part 3 like on the agrarian question of the South by Moyo et al, on effective demand management by Jan Kregel or on planning in a mixed economy by CP Chandrasekhar capture the challenges on these experiments into which several parts of the world embarked upon after WW II. One is tempted to engage deeply into the myriad complexities of such development experiments, which threw up interesting insights into the workings of diverse economies, much of which has been lost with the onset of financialization. This though must be left to the reader. A couple of essays on the Soviet development thinking and its contradictions and the Chinese experiments with opposing ideas in the Mao-era and the post-Mao period could have been interesting additions to the already rich collection of development thoughts. Also, a greater engagement with the relation between ecology and development, going beyond the concepts of ‘green capitalism’, seems necessary in the context of increasing climate challenges. Controlling the pace of technical change through a social process is an idea that Patnaik mentions in his essay but the same also emerges in the reading of Christopher Freeman by Arocena and Sutz. A more focused engagement with the question of technological choice and alternative social ownership of production may be germane to rethinking development in the ‘Anthropocene’ period. Notwithstanding these observations, the Handbook of Alternative Theories of Economic Development is a much needed intervention in the field of economics and development policy, given that new ideas and rethinking of old paradigms is our only hope of rescuing Development Economics from the troughs into which it has sunk under neo-liberal hegemony. Arindam Banerjee teaches economics at the School of Liberal studies, Ambedkar University Delhi. 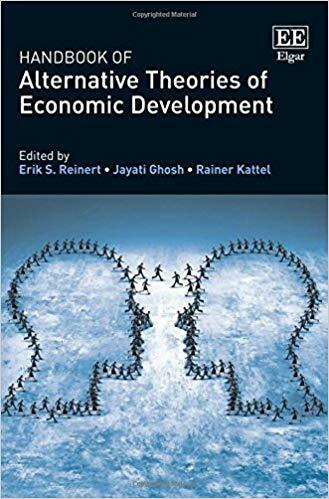 The Handbook of Alternative Theories of Economic Development is a refreshing initiative of creating an engagement with alternative ideas of development that challenges the four decade-long dominant paradigms of mainstream economic theory and development policies.